The likelihood that you run productive meetings is roughly the same as a coin toss. * Keep in mind that the higher you go in organizational life, the more meetings you lead. If you want people to respect your leadership, run meetings high performers love to attend. When you tolerate low commitment and lack of follow-through you dishonor effort. Don’t invite persistent drifters to meetings. End attendance by title. Establish a policy that only those directly involved in the agenda attend meetings. Expect all attendees to participate in equal proportion to others. (On average.) If they aren’t going to participate, they shouldn’t be there. Invite people who think they ‘need to know’ to conference in. Don’t let them be seen or heard. Don’t allow them to guide after the fact. Invite key front-line employees to meetings that impact their area. Everyone needs to complain a little. No one needs to complain a lot. Effective meetings begin when people turn toward the future. 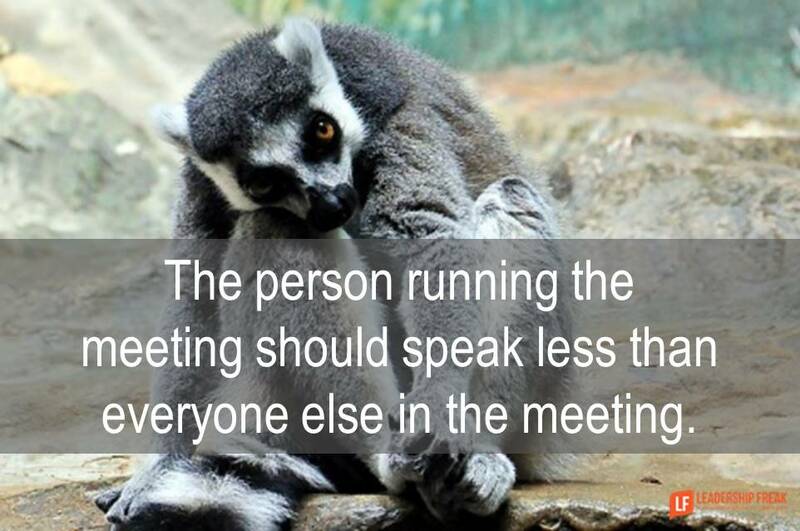 The person running the meeting should speak less than everyone else in the meeting. Create ways for people to interact with each other more than interacting with you. Make yourself dispensable to the conversation by creating an environment where people talk to each other. You know you’ve gone wrong when people look to you rather than each other for solutions. What one thing might move meetings from boring to effective? Hi Dan, Great list! I would add, the meeting didn’t need to happen in the first place. Unless the meeting is carefully designed to make decisions or improve relationships, the communication could have probably been handled in a more productive way. Thanks Karin. Great seeing you here. I looks like you are doing really well with your book, Winning Well. Congratulations! Yes, great addition. Just think of the cost savings if unnecessary meetings were canceled. This has been a big focus of my operational transformation efforts the last few years. In several organizations, I’ve found that many meetings are happening because the work being done isn’t visible. Because of this, we hold meetings to talk about work – NOT to make decisions. Using simple visual management to show the flow and progress of work, in conjunction with a VERY short, daily, stand-up huddle around those visual tools, has eliminated hours of meetings! Thanks Wesley. Brilliant observation re: visible / invisible work. We’re using a huddle and find it effective. I like the idea that only those directly involved in the agenda should attend the meeting. It is a waste of time or counter-productive to have everyone attend a meeting just because, if you don’t have a role to fill or aren’t actively contributing to the project then you should not go. I also think it is important to end a meeting with what action items need to be tackled, by whom and with what deadline. Then everyone is on the same page as to what needs to be done and who is going to be held accountable. Thanks Mitra. Yes… thanks for pointing out how to end a meeting well. It should be a red flag if there are no action items at the end. For me one thing that creates irritation or boredom (depending on my state of mind) is lack of respect for punctuality. I find some organizations do not value punctuality and a meeting may start 15 minutes late, as they wait for stragglers to arrive. A meeting should start when it is scheduled so participants who arrive on time feel valued and not bored for the first few minutes as they wait for others to arrive. Waiting supports tardiness and soon no one is arriving on time. Thanks Kathy. Don’t you love it when the leader helps late comers get up to speed! Ugh!! I do agree however It’s really hard to be on time to a meeting when the meeting prior ran right up to time or even a few minutes over. That is my pet peeve…ending meetings late. I like to schedule a meeting to end 5 or 10 earlier (before the hour). People really appreciate the time for a bio break or to physically move to the next meeting location if they have another meeting. I also find that people are more attentive when then know they will get a break before running to the next thing. Thanks Lucille. You make me think about our overall approach to managing and respecting time. Much appreciated. Meetings that don’t accomplish anything drive me crazy. If I’m taking time out to meet with other people, then there should be an outcome that I need to happen as a result of meeting. If we don’t need to meet, then why are we doing so? Send an email. IM me. Or call. Work needs to be moved forward, or the meeting is useless. Thanks Elizabeth. You have my vote! FORCE A DECISION TO BE MADE!!!!!!!! No, but making decisions brings on change most of the time. Folks do not like change. Folks like to believe they are a part of the decision making process. Problem, folks have taken the decision delaying process to an art form. Too many meetings are for stroking managements’ ego through the guise of management displaying their power-centrist behavior. Oh boy — this is top of mind for me right now. I’m a newly hired manager and new to the organization. I was very upfront in my interview about my commitment to strategic plans, goals, metrics, execution, and results-based accountability. All that talk was met with apparent enthusiasm. I have been shocked by the vast number of meetings my superior holds, and without agendas or a clear statement of purpose about what is to be accomplished. In my case, “I didn’t have time” applies precisely because I am constantly summoned to so many meetings that have no agenda–written or spoken, no articulated business case, and no relationship to a strategic plan (because that plan does not exist). I don’t have time to review my own meeting notes when I’m running from one thing to the next. All this creates an appearance of busy-ness. Being busy isn’t the same as being productive. Avoiding articulating goals gives people cover. Help!! Thanks Anon. “The appearance of busyness…” Oh boy!! That’s a good one. So glad you dropped in. Great comments above! I try to make sure that we play and have fun as a team. Learning and together in a playful way.